The 2007 iMac is really a funny machine. On the one hand, it’s a relic. It’s nearly 7 years old, and in computer time, that’s an eternity. So many things have changed since 2007. Yet, at the same time, it has a 2.4ghz Core 2 Duo, which is dual core and 64 bit, plenty powerful for most tasks. It also has a beautiful 20” monitor. The disk situation is a different story. The default model came with a 500GB sata drive, and the DVD superdrive is actually connected via PATA. When my dad told me that the iMac was running slowly and needed a tune-up of sorts, my initial instinct was, “Dad, this thing is 7 years old. Let’s get you a new one.” However, when I played around with it, I found slow shutdown, slow bootup, slow opening of programs. This told me that the disk was the weakest link in the machine. I told my dad that I would try to replace it with an SSD to see how that would work. I told him that if it worked, it probably would breathe another couple years of life into the computer, and if it didn’t, I could eBay my recent purchase and he wouldn’t be out much cash for the attempt. I got a great deal on the 480GB Crucial M500 SSD. I also ordered a bracket that would be used to mount the 2.5” SSD in the place of a standard 3.5” hard drive. If you have ever taken apart an iMac, you know that it is a bit daunting. Unlike unscrewing a standard computer case, you have to use a suction cup to ply the screen off. Once you ply the screen off, you then use a torx screwedriver to get the rest of the thing apart. It can be quite stressful if you haven’t taken apart a bunch of electronics before. I finally got the thing pulled apart, though, and then I was able to remove the hard drive. The good news was that the 2.5” drive fit inside of the 3.5” bracket perfectly, making it an easy replacement mount. There was one piece of bad news… Take a look at the above picture. While it may appear to be a perfect match, it turns out that the SATA cable in the iMac extends JUST far enough to plug in a standard hard drive, which has the connector lined up completely on the right. My bracket places the SSD right in the center, which moves the connector over a half an inch or so. After trying to stretch the cable carefully to new avail, I resorted to another solution. 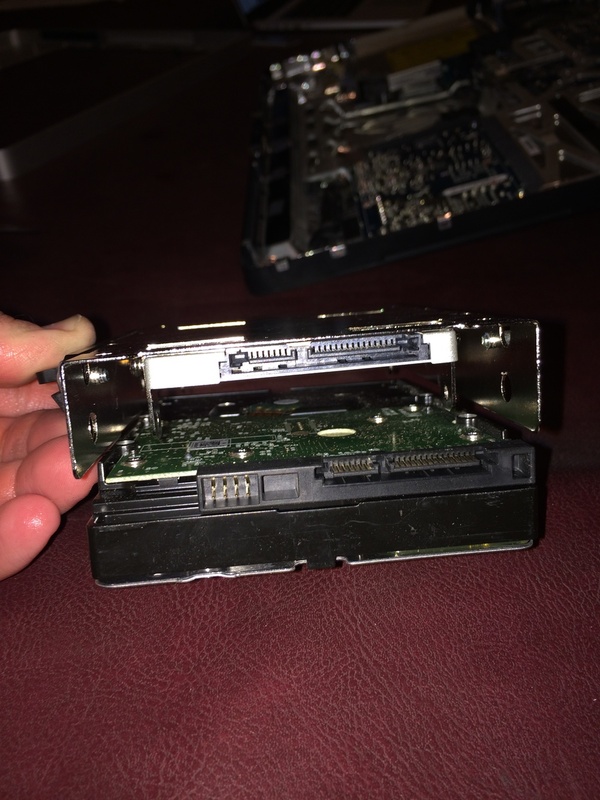 I bent one of the pieces of metal that holds the SSD to the bracket and slid the SSD all the way to the right of the bracket. From there, I used the world’s most convenient adhesive, duct tape, to make sure that the SSD was completely secured to the bracket. It worked! As I started rebuilding the machine, though, I couldn’t help think that Steve Jobs wouldn’t exactly have been proud of my solution, as a man who always insisted that the components on the inside be just as beautiful as those on the outside. 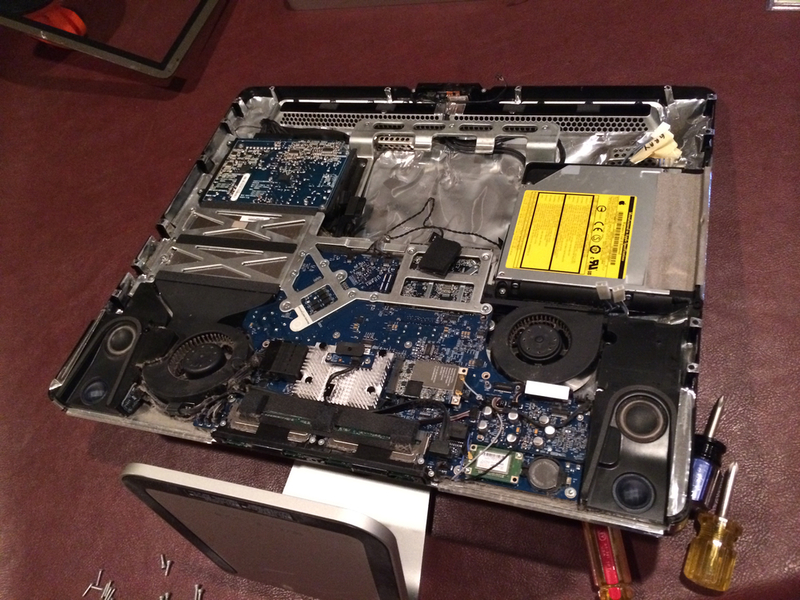 Every time I take apart an iMac, I’m always a bit nervous the first time I try to turn it on after reassembling it. I had it all put back together, I pressed the power button, and boom – I got that nice Mac ding, and from there, I used an external drive adaptor to copy the contents of the existing drive to the new SSD. Once the transfer was done, it felt like a brand new computer. Everything was ultra snappy. Being 7 years old, it of course doesn’t have the most powerful GPU in there so you wouldn’t have to do too much graphically to bring this computer to its knees, but for my parents’ iPhoto / web browsing needs, this machine is perfect. It still runs OS X Mavericks, and thus, it’s not really limited in any way. In fact, I still have one last upgrade left for this Mac. While it only officially supports 4GB of RAM, it can actually capacitate 6GB. I’ll soon order a 4GB module from OWC, and the machine will get a 50% boost in RAM. This upgrade experience made me realize what great value there is left in these older iMacs. You can pick them up pretty cheap on eBay, and if you don’t mind swapping out the hard disk for an SSD and upgrading the RAM, you can have a VERY fast family web browsing machine on the cheap. Consider that Apple STILL sells machines with only 4GB of RAM. My hope is that this machine will actually be able to run the NEXT version of OS X, Syrah, as well. I feel like the only reason it wouldn’t be able to is if Apple were to put a GPU requirement on the new version, as the rest of the specs stack up decently with modern computers that Apple sells. I did almost the exact same upgrade recently too and it’s like a new machine. I opted for a 2TB spinning drive, rather than an SSD—this is my iPhoto work horse. With the new disk and RAM upgrade it's light years different. The surgery wasn’t for the faint of heart, though. I had to consult various YouTube videos to guide me; Apple sure doesn’t want you mucking in there. This is a great article and very helpful. I recently started buying used and refurbished Apple computers because the cost is so much better than brand new and I just don’t need brand new. But like older cars, it is very helpful to know how to keep them running smoothly and this article really helps. 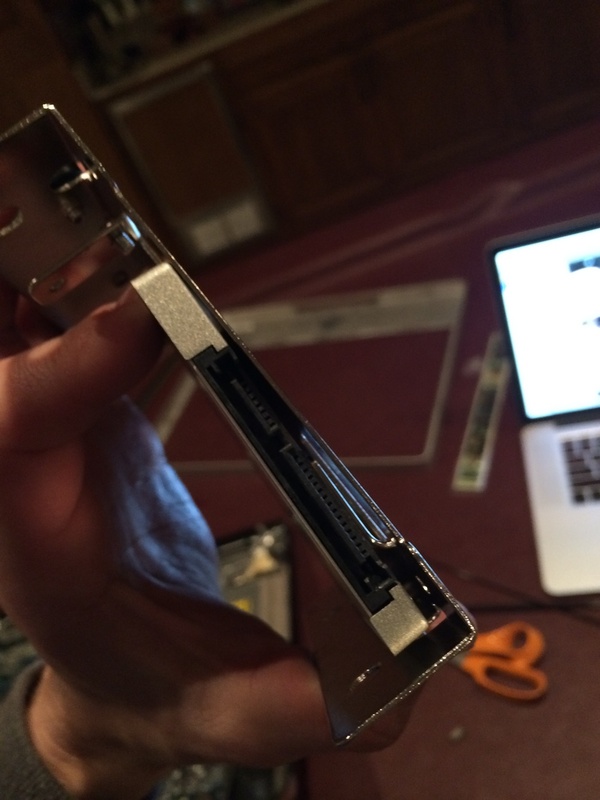 Thanks for posting about your SSD upgrade to your imac. I have the same machine and plan on doing the same upgrade. Do you by any chance remember what the brand name of the bracket was? Most of these brackets cost <$10, but I wouldn’t be surprised if some brackets fit better than others, or if some don’t fit at all. Also, it sounds like you have a lot of experience upgrading macs. 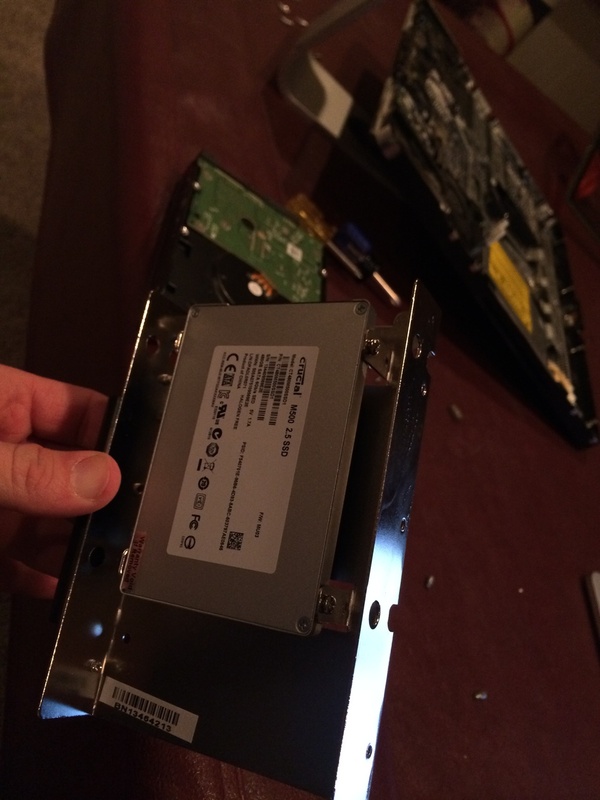 Have you ever swapped out other components—optical drives, fans, etc? I just bought another 2007 imac ($200 with a wireless keyboard and mouse) that works just fine, but it is making a constant purring sound that I think is coming from the optical drive fan. I don’t remember which bracket it was, but I wouldn’t necessarily recommend my bracket! If you look in the article, note that I had to use duct tape to get it to stay in the iMac :-). OK. I read the entire post, yet somehow forgot that bit. 🙂 Maybe I’ll go with the best reviewed bracket on Amazon, etc. Thanks for posting. I did the same here in the UK with my 2007 iMac. I bought the kit (SSD plus Torx screwdrivers plus suction cups) from macupgrades.co.uk, and followed a YouTube video which showed how to take it apart and replace the drive. The only problem I had was getting the setup to recognise the new hard drive – it couldn’t find it. I had to fiddle around with things a lot, and eventually worked out that I needed to reinstall the OS on to the SSD from a DVD. Everything works fine (it seems about three times faster), and I’m very happy with the result. I expect it will last me another three or four years at least.